Plants facing stressful conditions like drought produce their own aspirin-like chemical, US researchers say. The chemicals are produced as a gas to boost the plant's biochemical defences, say scientists from the National Center for Atmospheric Research in Colorado. They suggest that monitoring this could give farmers early warning of possible crop failures. However, they also say the chemicals could affect pollution levels by combining with industrial gases. Thomas Karl, who led the study, said the chemical triggers "the formation of proteins that boost their biochemical defences and reduce injury". "Our measurements show that significant amounts of the chemical can be detected in the atmosphere as plants respond to drought, unseasonable temperatures, or other stresses." 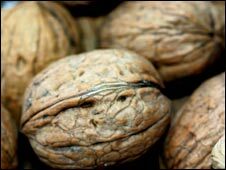 Writing in the journal Biogeosciences, the researchers said they found the chemical accidentally when they were monitoring emissions of volatile organic compounds in a California walnut grove. Mr Karl said the chemical - methyl salicylate - could act as a "warning signal" allowing farmers to take action against pests much sooner. "The earlier you detect that something's going on, the more you can benefit in terms of using fewer pesticides and managing crops better," he said. The researchers believe it may also help plants to signal danger to one another. "These findings show tangible proof that plant-to-plant communication occurs on the ecosystem level," says Alex Guenther, a co-author of the study. "It appears that plants have the ability to communicate through the atmosphere."